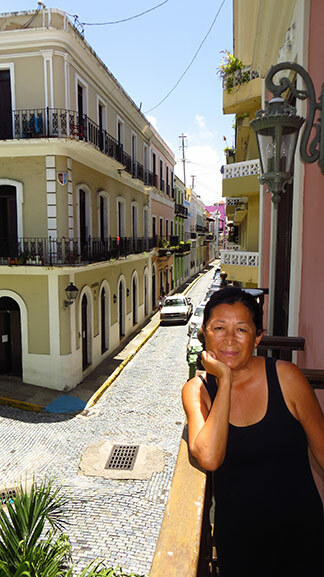 If you're thinking about a weekend trip to another Caribbean island while visiting Anguilla, staying a weekend in the El Convento Hotel in Old San Juan, Puerto Rico should surely be high on your list of considerations. 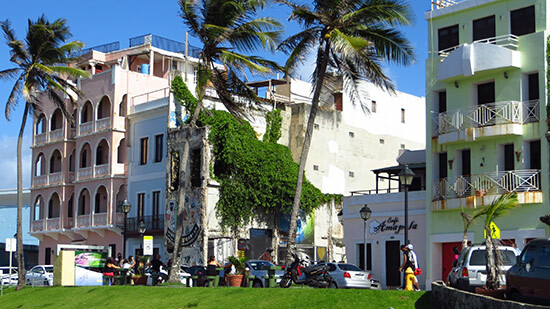 San Juan is divided into several major districts. 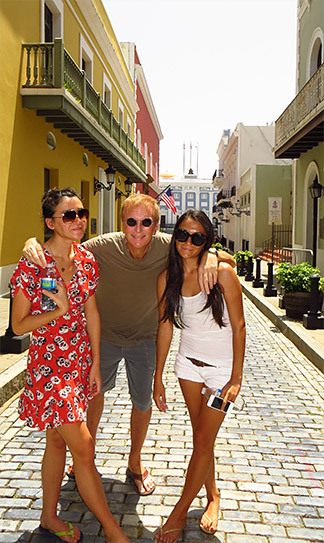 The best-known are the beach/tourist regions of Condado, Isla Verde and Old San Juan. 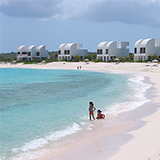 These regions offer more typical, modern, high-rise luxury beach vacations, complete with Louis Vuitton shopping. 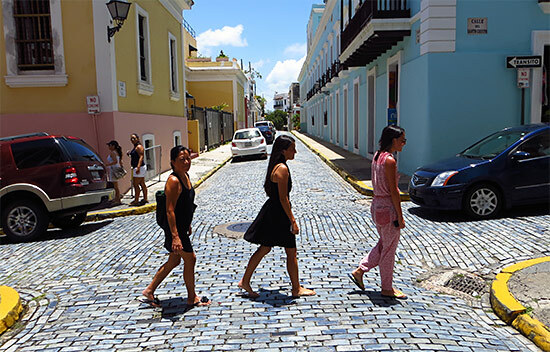 Seeking a slice of life truly different, Old San Juan was the right choice for our home base on a weekend trip to Puerto Rico. 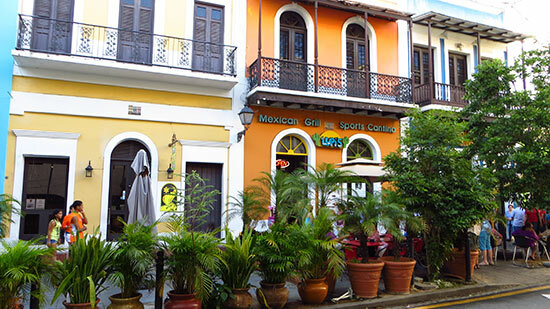 Colorful buildings line narrow cobblestone streets, locals fill the bars and tapas restaurants on Friday nights, and the area is home to significant Puerto Rican history. In fact, the area's historic charm is so well maintained that, at first glance, it seemed almost contrived. 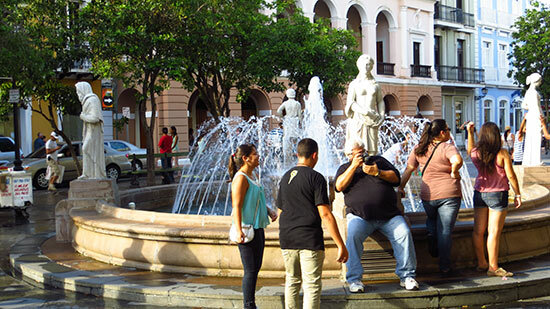 While parts of Old San Juan are clearly more geared to tourists than others, Old San Juan, on the whole, is genuinely Puerto Rican. 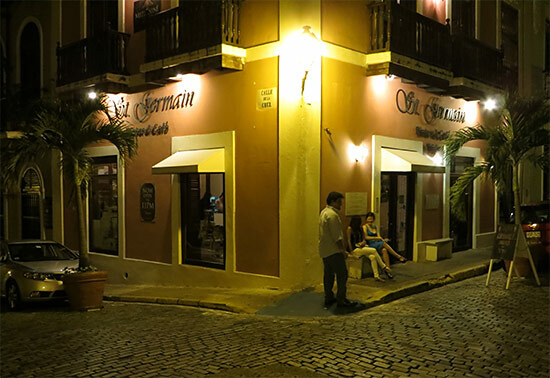 On our walks through Old San Juan, our hearts fell captive to the people, the sights, the restaurants and the many, many cute "gatos." 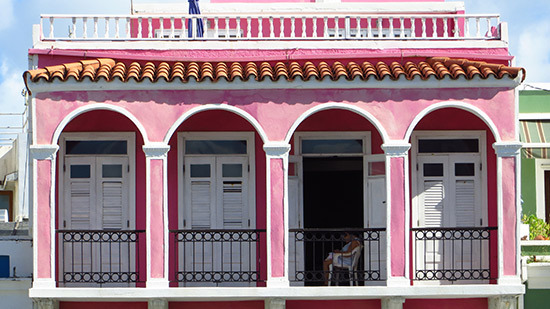 Nearest to our hotel, El Convento, we explored the area around the Governor's House first. Spanning a couple of streets, colored a pastel blue and with white ornate trimmings, it's impressive and heavily guarded. Right behind a camp of Puerto Rican school kids, it's one of the area's bigger attractions. We continued on the small streets, passing luxurious shops (including Cartier). At the end of the road, we came to Parque de Los Palomas, filled with pigeons as the name suggests. 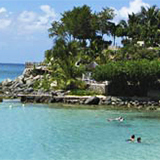 At the park's entrance, lies the picturesque Christ Chapel, which overlooks the ocean and where the cruise ships dock. 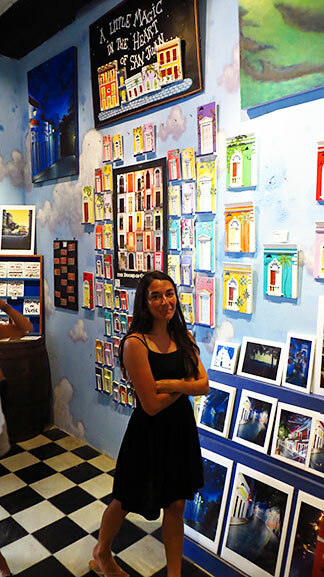 From Christ Chapel, we weaved through the small roads, and found ourselves further east inside one of the sweetest souvenir shops, Mi Pequeño San Juan. 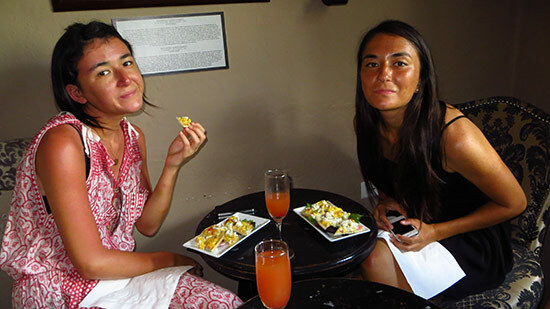 Owned by two sisters, the creations are unique. 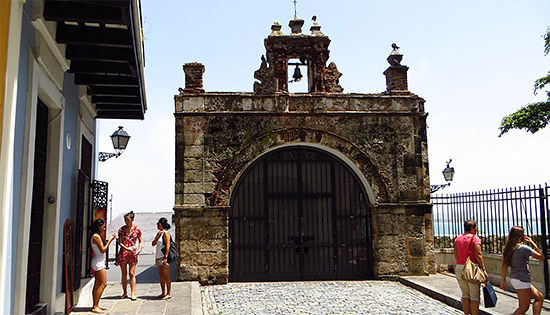 Hand-crafted, they make miniatures of Old San Juan's signature doors and chapels. All are sold at a fair price. Nearby, these sisters also own a shop selling poetry-based work. 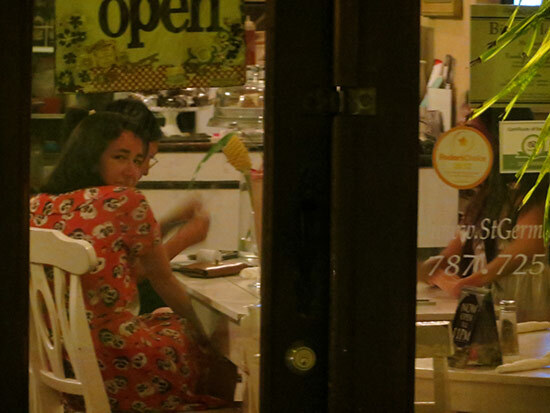 There is a poetry reading corner, and a cafe, too. Their artwork is heartwarming, and really strikes a chord. It's rare to find people executing original concepts beautifully and passionately. 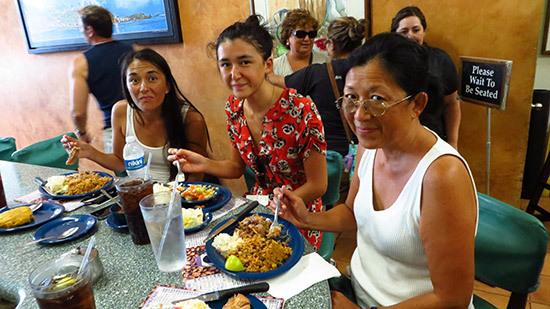 Crowded with locals, we knew we had found a gem of a diner! The waiter was kind and spoke English. We went with the daily special, made Fridays only... roast pork served with rice and peas and potato salad. On top of that, we ordered a side of mofongo, something completely foreign to us. We had to try it! 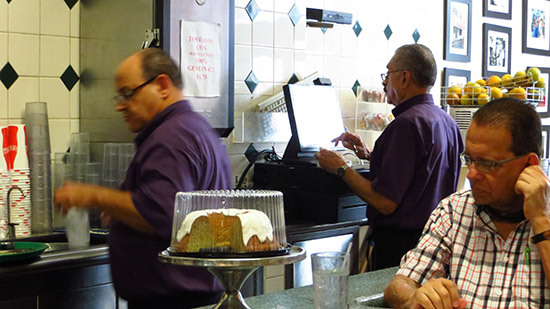 The food was hot and service was friendly and prompt. Heaping with shredded, pulled pork and a mountain of rice and peas, how would I ever finish my plate? The pork had a smokey-salty hint. Mouthwatering! With more food than we could finish, we ate for under $50 for the four of us. Lazy and sleepy after a huge meal at Cafe Manolin, we hopped on the free trolley that circles Old San Juan. I highly recommend it if you want to gain your bearings and get a lay of the land. 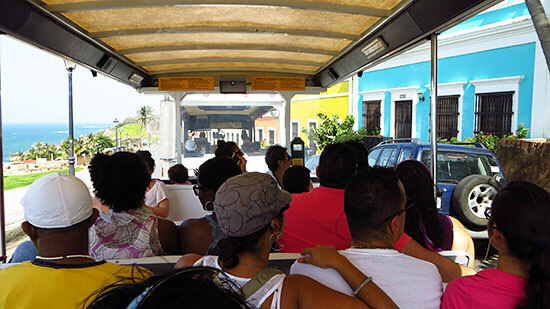 Starting out on the west side, the trolley circles over to the Plaza Colón and up to the northern side, stopping at all of the historic sites, including the Castillo San Felipe del Morro. That day was the start of the weekend "Feria de Artesania." 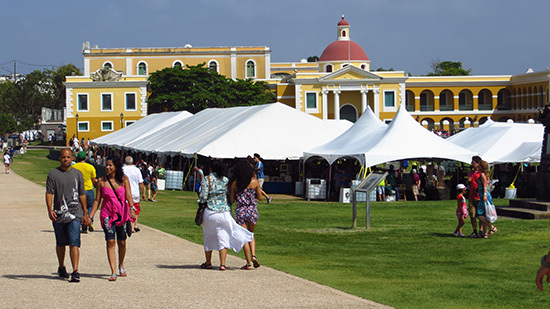 With lots of vendors selling artwork, locals and tourists alike walked the vast, green grounds. Just beyond where the festival was held lies the fort itself. 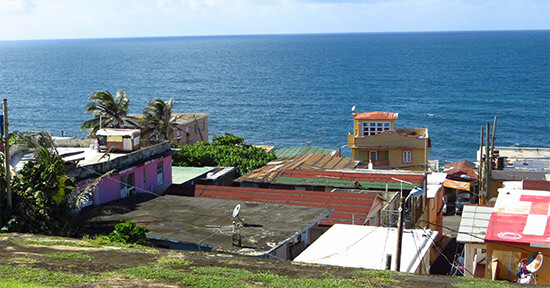 It overlooks the rough sea and the northern side of San Juan. 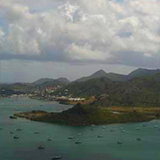 Across the way is mirroring castle, San Cristóbal. 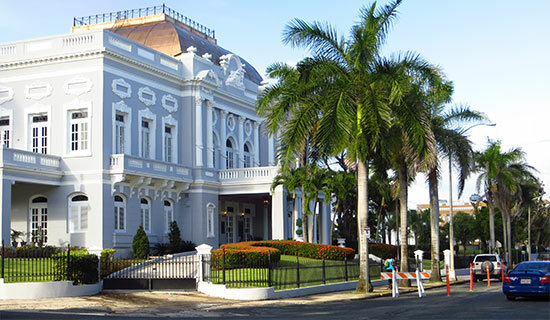 The trolley also goes past Antiguo Casino, a luxurious building now used for conventions. 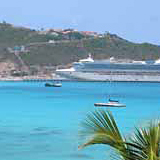 We looped down to the south of the city, too, near where the cruise ships come in. The further south you go, the less historic the whole area feels. At its most south you will find a Sheraton, Hard Rock Cafe, Starbucks, all of the American staples. Still, it is not overly touristy. There are plenty of locals walking around, dining, taking photos. The atmosphere is happy and friendly. 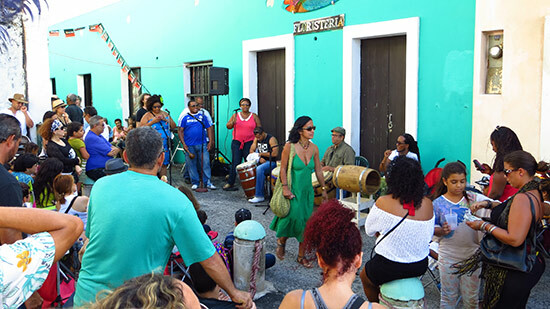 We returned to the northern part of Old San Jaun several times to explore the ins and outs of these quiet streets, which are marked by pockets of lively bars and restaurants. 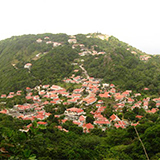 Populated largely by Puerto Ricans, the area has a distinctly more local, authentic feel. Things feel different in this part of the city. Not all of the homes have been restored. (Lots of fixer-uppers available!) Most of the bars are low-key. And, many let you take your beer out into the street so you can smoke and drink with little inconvenience. 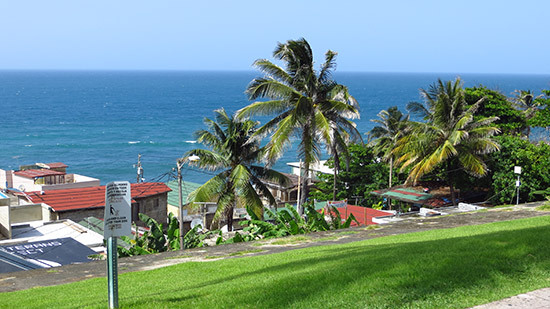 Venture outside of the north's winding streets, and across the large and wide Boulevard Del Valle, and you fall upon "La Perla," an area known for its dangerous and illegal activity, but also for its art and surf community. 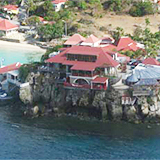 We didn't venture down into La Perla, only looked at it longingly from above. With the vast ocean ahead, watching the surfers from atop was breathtaking. It must be stunning down on the shore. I have to say that since my three years in NYC I have fallen out of love with the idea of city living. 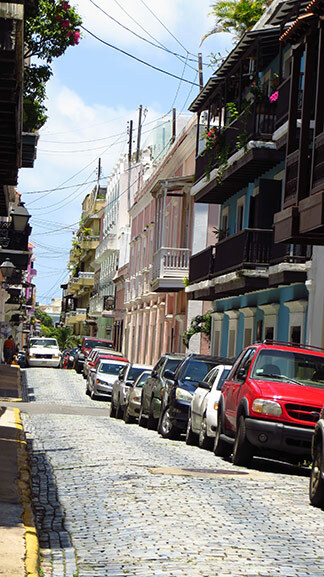 But, this part of San Juan revived that fantasy. 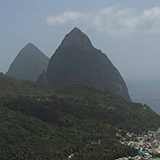 With the deep blue sea as a backdrop, lively, relaxed bars and tapas restaurants at your finger tips, and surrounded by winding streets, the area captures the imagination. On the note of bars and restaurants, on the way back to our hotel we came across St. Germain Bistro & Cafe. Quaint, affordable, with a French menu, we visited this spot several times. Lit up, its contrast to the dark, cobblestrone streets catches the eye. 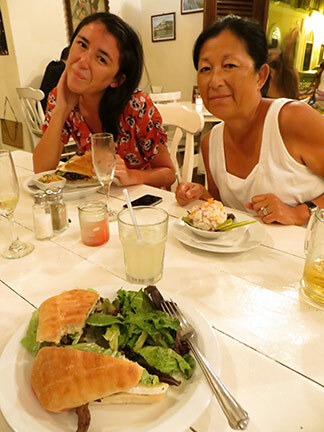 Inside, Spanish is spoken at every table (the waitress speaks English fluently), the decor is a refined type of rustic, and the food is good. Note: The Puerto Ricans love air conditioning. Bring a sweater! By the end of dinner my teeth were chattering. 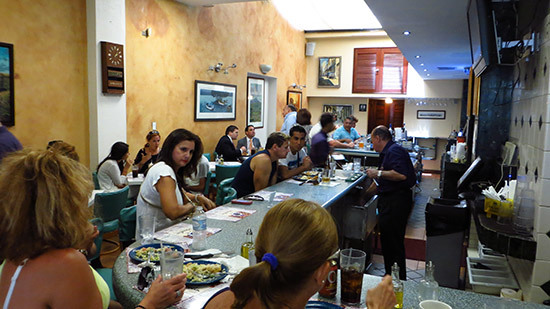 The menu features a variety of appetizers, quiches, soups, sandwiches, pizzas and salads. We started with "moroccan," which was toasted pita bread and homemade hummas, and the "leaning tower," a caprese salad artfully presented. We all ordered the Karlox. The Karlox has steak, mayonnaise with cilantro, brie, lettuce and tomato. It's served on a fresh, soft ciabatta. We had hoped to return the next morning for brunch, but the wait was about an hour. Their "floreli," scrambeld eggs and onion on a baugette, served with smoked salmon and tomato, sounds especially divine. In a rush to catch a plane, we went to their "mezzanine" a second restaurant upstairs that has more of a lounge type atmosphere. There, they serve regular tapas in the evening and breakfast tapas on Sunday mornings. The scrambled egg pita was particularly good, and so was the prosciutto and brie on baguette. With a guava mimosa, it's a great way to start the day. 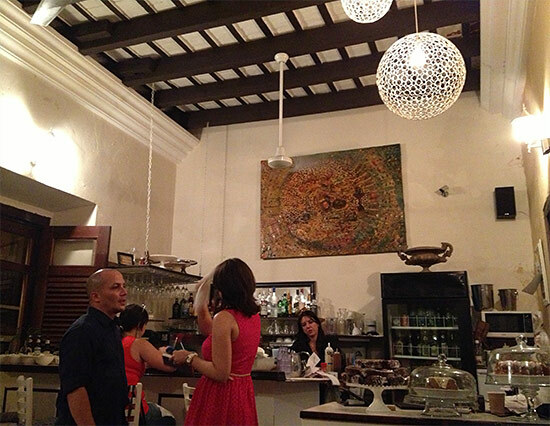 And, the restaurant is just around the corner from El Convento! 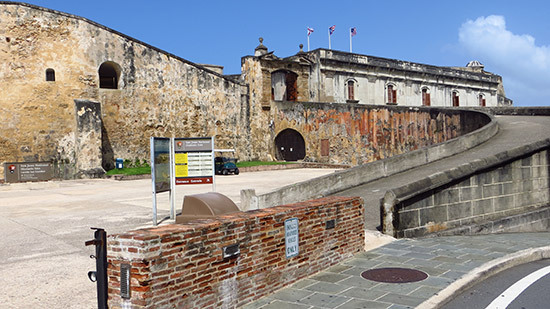 Historic and genuine, Old San Juan is one of those special corners of the globe that everyone should experience at least once.